Today we’re in Prague and apparently they say “Ahoj” (pronounced ahoy) instead of hello. Therefore, Ahoj blog readers! This morning began back in Dresden with a wonderful breakfast spread where I ate croissants, bacon, and rolls. Are you noticing a trend yet? After breakfast, chaperones checked the rooms and we began our journey to Prague! On our way to Prague, we stopped at the Terezín Fortress. This fortress was used as a political prison prior to the second world war. However, the Nazis converted the prison into a concentration camp for Jews, Gypsies, homosexuals, and resistance members during WWII. The most notable prisoner to ever pass through Terezín was Gavrilo Princip, the man who assassinated Archduke Franz Ferdinand and began World War I as a result. The walk through this camp was incredibly moving and shed a light on how terribly people were treated in these camps. I think this quote perfectly summed up our day at Terezín, its sombre nature, and how it has shed a very real and bright light on the injustice faced by people during WWII. After our tour through Terezín, we headed back to the buses and continued on our journey to Prague. We arrived earlier than expected and ended up with almost two hours to spare at and around the hotel. Each group of tour members took this free time to their advantage and went food shopping, clothes shopping, took naps, played cards, enjoyed some quiet time, or got dressed up for our night on the town. At 6:30 PM we met downstairs for dinner. The restaurant was right across the street which was super convenient and easy for those of us in heels. Dinner was surprisingly very good and filling despite it being a sit-down dinner where not much choice was given to the tour members. After dinner, we began a short walking tour led by Helmut. Don’t worry, those of us wearing heels were given 5 minutes to run up to our rooms and change into sneakers. 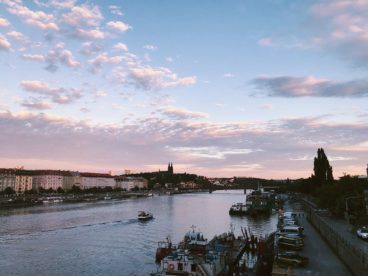 The walking tour brought us to the Vltava river just as sunset was beginning. We got to see the most beautiful cotton candy skies as we walked along the river. Lots of pictures were taken and laughs were shared during this walking tour. 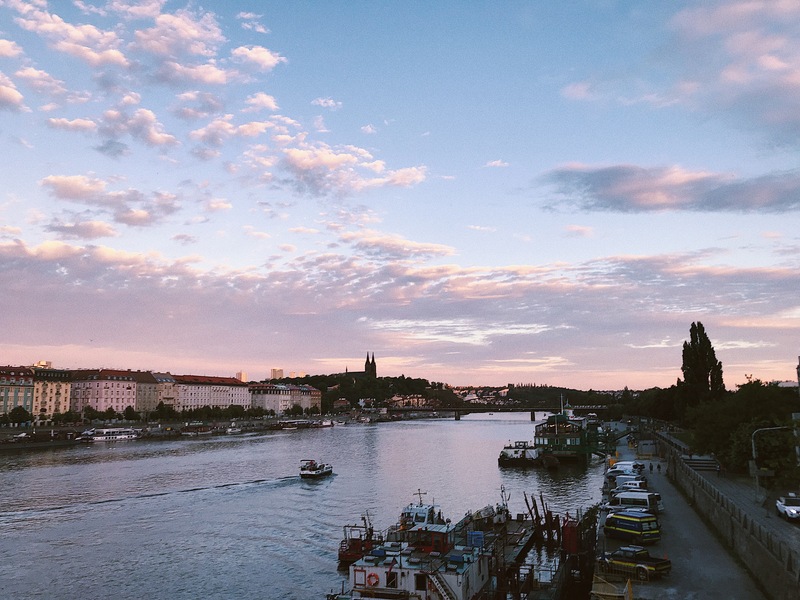 It was the perfect end to our first day in the Czech Republic. Can’t wait to fill you in on all things Prague after another busy day tomorrow!